I finished the first draft of my memoir a year ago. I spent months writing a proposal for the book. I got slightly discouraged/overwhelmed shopping my proposal around to literary agents. I started this blog, joined Facebook and Twitter. I wrote an essay about life on St. Vincent for publication (fingers crossed). And now it’s time to polish this draft and get it published. 1. Set my alarm clock for the wee dark early hours. 2. Encourage my children to sleep until 9:00 am. 3. Write, write, write, edit, edit, edit. I need your help! If you haven’t already, click “Like” on A Dream Made Truth’s Facebook page. If you’re out there keeping tabs on me, you’ll help me crawl out of bed every morning and get to work. I’ll post snippets from what I’m working on several times a week, but only on A Dream Made Truth’s Facebook page and Twitter. Brian’s been helping me brainstorm a giveaway for Facebook “likers” (hint: it has to do with eating) and I’ll post the details in a few days. And if you’d like to be the very first to see new blogposts, sign up to receive posts by email. They’ll be in your inbox the second they’re published and it only takes a second (see instructions for subscribing in the website’s upper left hand corner). First snippet’s on Facebook already. Support me! Win stuff! Click “Like“! I’ve had this series of atonements roll in lately. First, it was this radio story, Midlife Cowboy, that is so completely different from my story, but the ending, the ending was what I needed to hear after the rejection from the prestigious literary agent partly because of my ending, to keep me going and tell me my ending was alright. Then, on a day when the revising of my manuscript was feeling overwhelmingly neverending, this photo showed up of President Obama’s hands holding his mess of a marked-up speech-in-the-making. I suddenly didn’t feel alone. I mean, if those most accomplished in the world are making massive revisions, imagine all those in between me and him who are doing it at this very minute. Then there’s this. Many days over the past year we’ve questioned whether adopting our akita from the local animal shelter was a good idea. Don’t get me wrong, we totally love him, but man, is he a lot of work. So we watched Hachi: A Dog’s Tale last week, and the special feature where the show business dog training experts discussed the challenges of working with akitas made me, at least, feel better. I still might design a video game, tentatively titled: Take Hoshi for a Walk. Pure adrenaline pumped unpredictableness. And the 110 year old rejection letter popped up and I would imagine anyone trying to get something published would appreciate this. What I found interesting is the similarity of modern day literary agents to those of yesteryear. They speak bluntly, but they’re amazingly polite and often encouraging. I’m still holding onto this line from a rejection letter I received: “I absolutely think you should continue pursuing representation.” The agent who wrote that is my favorite, so far. Then after a crime happened last weekend on my street that made me question whether this is where my children should be living, this appears, reminding me of why I love my neighborhood and really do want my kids living here. This isn’t even all of them. It wasn’t until I started writing this that I realized I was describing life at Petit Byahaut, except on a much more subtle and less interesting scale. And as crazy as it may sound, I miss that ride. So, I’ve decided I’m going to keep looking for these little redeeming things. Maybe they’ve always come. (I’m between my brothers, with the black eye), Simon gave himself a black eye. 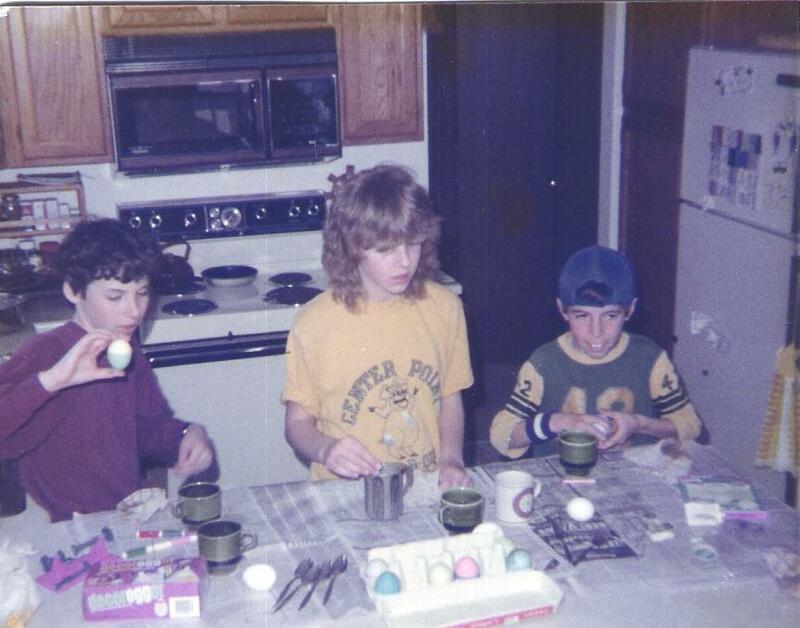 Easter 1984, I had the black eye. Easter 2010, it’s Simon’s turn. What does that mean? This is an interesting time to be a new writer. With the advent of ebooks, the possibility of getting your work seen has skyrocketed. Ebooks are all the talk these days. Just last week, The New York Review of Books wrote about the digitalized future of the publishing industry, The Guardian blogged about the environmental pros of ebooks, and The Wall Street Journal wrote about ebook reader options . Will ebooks take over the publishing world? Some adore the idea, some despise it, but if sales of Apple’s new ipad are anything like the ipod, it looks likely. Then, there’s self-publishing . No longer does the writer need to foot the bill for (and then store) hundreds or thousands of books they hope to sell. Thanks to print-on-demand technology and the opportunity to obtain an ISBN, their books can be made available to purchase from the likes of online giants like Amazon and Barnes & Noble to smaller retailers that have a print-on-demand machine. There are at least two local bookstores in Seattle with the capability. Of course the toughest hurdle of going it alone is marketing your book. Although a daunting prospect, the opportunities are growing, thanks largely to social networking and blogging. While the publisher of well known author, Frances Mayes, is offering a chance to win a free signed copy of her latest book specifically to those who write a comment on her website, lesser known authors can attempt to climb the charts by giving away copies in the ebook format, no strings attached. None of this is to say I think agents and big-name publishers are obsolete, my question is, is it still absolutely essential for an author to have the two? I thought I was totally prepared for rejection. I’ve been sending out query letters to prospective literary agents, fully planning on receiving at least fifty rejections before finding a single agent excited about taking me under their wing or deciding to go another route. I’ve been holding my head high when I receive “thanks, but no thanks” responses from agents. One more down, thirty seven more to go. About a month ago, a big-time, well respected, New York City literary agency asked for my 124 page proposal. I nearly took flight. Really? They want to see more? Excitedly, I whisked my proposal off to them, but truly, I was expecting a rejection from this agency. I’ll use their feedback to refine and improve my proposal, I told myself. Instead, when the big time agency replied last week deciding not to take on my book, I instantly turned into a the-glass-is-half-empty type of person rather than my usual the-glass-is-half-full. Why was I sulking around the house? I had just received a free critique by a professional in the industry. After analyzing my reaction in my sad state for a few hours, I decided it was because she didn’t get it. Maybe I shouldn’t be sharing this with the world, but I want your input. Really, I do. First, she told me she wasn’t convinced our experience could be turned into a book. She thought it would better make a travel magazine article. And here’s what really stung. It was the second time I’ve been told that. But I’m fine with it. I know the material is there but if it’s not obvious from the 65 pages of my proposal that summarize the chapters, I need to spend some time going deeper. Secondly, the agent told me she thought the outcome of our dream wouldn’t translate well into a book. This is what really brought me down. I’ve struggled with ending the book all along. It’s true the dream was ripped from us, but the story is not so much about a dream-come-true-gone-bad as it is about the unexpected wild ride we embarked upon once we got to Petit Byahaut. 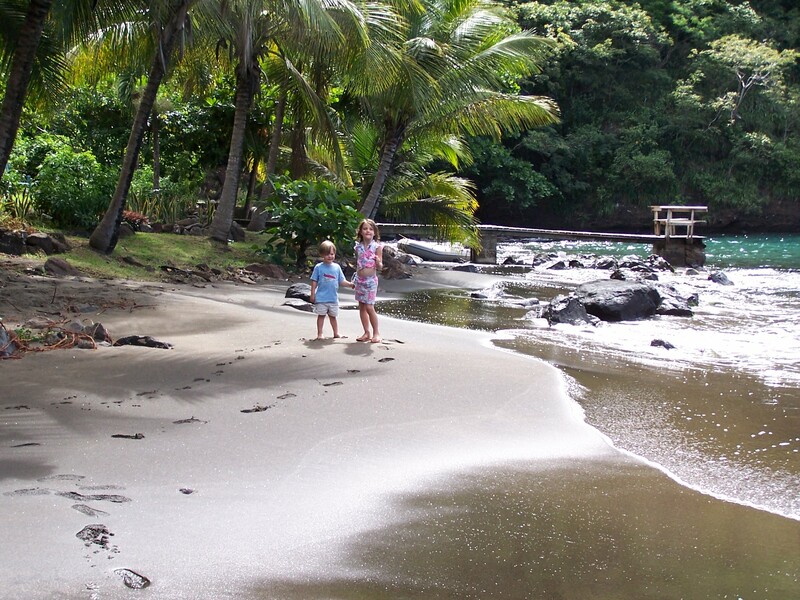 The idyllic aspects of living on a tropical island beach were so much sweeter than we had imagined, but the challenges were equally mind blowing and never ending. And even though the dream didn’t work out, it’s not like we were completely thrown to the road. Ok, maybe we were. But we’ve recovered, we live in a fabulous city, we’re co-owners of a popular restaurant, we’re healthy, we’re happy, we’re pursuing other dreams. Do you generally stay away from books that don’t end in happily ever after? Is the title, A Dream Made Truth, misleading? Maybe I need a completely different take from the beginning. Or a subtitle to clear things up. And if you agree with the agency’s comments, tell me. Don’t worry about hurting my feelings. Really, I’m back to the-glass-is-half-full. Becoming a blogger is no easy task. Maybe it is for some talkative types, but not for me. I’m a private kind of person. Except when it comes to A Dream Made Truth and St. Vincent and Petit Byahaut. I could go on and on forever about that subject. It was the reason for starting this whole website/blog. Then I realized the other day, in a sudden panic, that if every blog entry is about our life at Petit Byahaut, eventually, someday far down the road, I’ll have told the whole story. And then what would be the point of publishing a book about it? Were those four years I just spent trying to figure out how to write and publish a book and even producing first draft all for nothing? So I’ve sat in front of my computer in the early morning hours before the kids are awake every day of this past week, struggling to figure out what my next blog posting should be. Brian came home early enough to make dinner the other night when he realized how tormented I’ve been. When the kids asked if they could watch a movie, I said YES, and then he poured both of us a glass of wine and while he cooked a fabulous dinner with both a vegetarian pasta and a meat-eaters pasta to satisfy every appetite in the house, I spurted out all of my torment, the millions of ideas swirling through my head, my struggle of choosing which of the top two dreams on my list should be made into the next truth, and how much does a private person put out there for the world to criticize or snub or laugh over? But do I just throw something out? Where do I start? Does anyone care? Two more days have passed, me in front of the computer, researching interests and blogs and my dreams, and this morning… I started writing. And I’m posting it. It’s not easy being a blogger. Tomorrow? A place special to Brian and I—a place that fueled our desire to make our dream happen. So thankful for Brian. I’ve been deliberating over which excerpt to post from the book. Deciding on just the right peek into our life at Petit Byahaut has been challenging. But I think I’ve chosen. For now, I won’t divulge all the details about when Brian almost sunk the big wooden pirogue full of elderly guests, or the time a group of nudists showed up–half of them experienced and half inexperienced, or the splendidly fabulous evening sharing wine and savoring intelligent conversation with a famous Californian winemaker and his friends. Instead, you’ll find one moment in one average day at Petit Byahaut. Most days we went through the motions of what needed to be done, only to find the rollercoaster taking a sudden unexpected turn. This island dream has filled my thoughts for embarrassingly too many years. The funny thing is, once we got to our dream island, I began to conjure up all sorts of new dreams. Ideas that could be combined with our life on the island and ideas that were separate. I’ll post an excerpt from the book soon, and more photos of our life on the island, so keep checking back. And thanks for reading.